Renovations of century-old buildings of architectural merit often attempt to reconstitute particular moments of history. 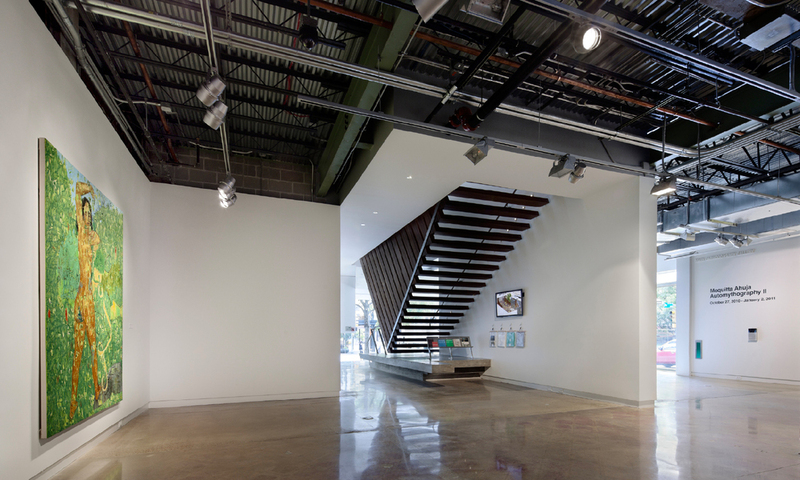 For this contemporary art space, however, LTL embraced the trajectory of the existing construction’s transformation, rather than returning it to a moment frozen in time. 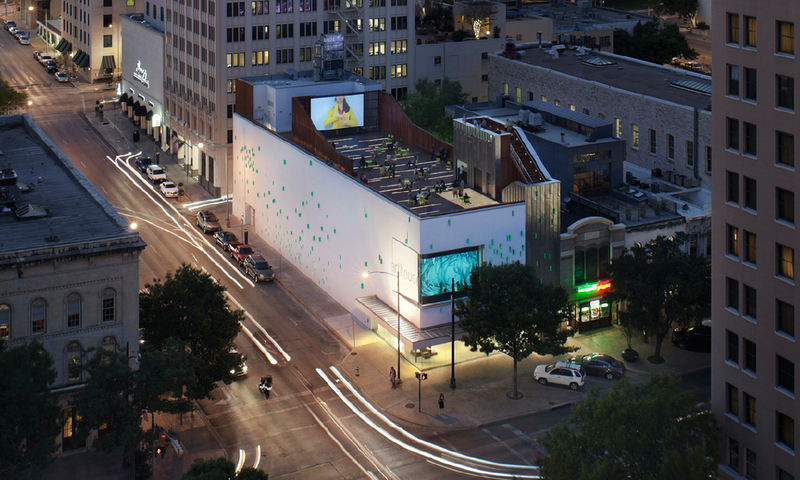 Located in the heart of downtown Austin, Arthouse is a renovation of a 1920s theater that was later modified as a department store in the 1950s. During the midcentury conversion, the building’s open structure, consisting of a concrete frame with steel trusses, was altered to include a single-story, steel-supported concrete deck. This second-floor addition cut in half the theater’s large proscenium space. Adding 14,000 square feet of new program to the existing art space, LTL intensified this peculiar accumulation of history by conceiving of the design as a series of further tactical additions and adjustments. These supplements revive and augment extant features—such as the trusses, concrete frame, and ornamental interior frescos from the 1920s, as well as the awning, storefront, and upper-level display window from the 1950s. 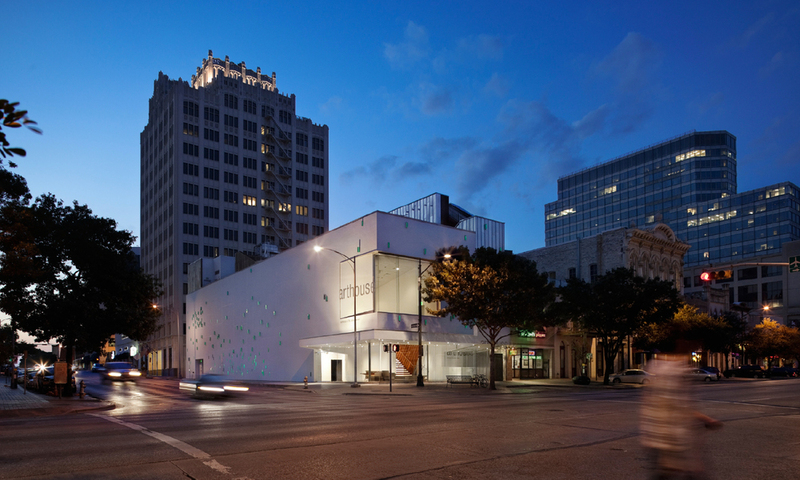 The building’s envelope intensifies exchanges between the city and Arthouse. 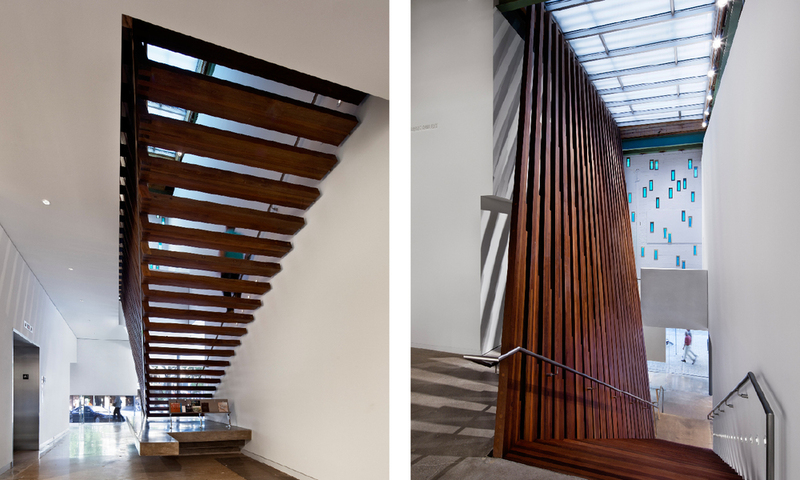 The entry lounge is wrapped in glass, maximizing sidewalk exposure and allowing glimpses into both floors of galleries. 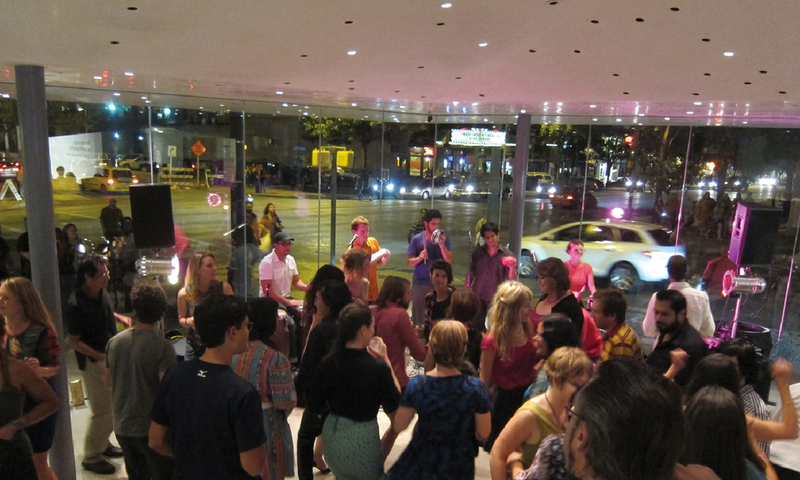 The 1950s awning is functionally enhanced by not only creating shade and capturing sidewalk territory outside, but also extending into the building in which visitors enter Arthouse beneath its name. The large opening of the second floor community room doubles as a projection screen visible from the street at night. The southern and eastern elevations are perforated by 177 glass blocks, which are lodged in the existing masonry. The quantity of perforations is increased where more light is needed—offices, studios, meeting rooms—and decreased where light is less desired, as in the galleries and lecture room. Set within the infill of the concrete frame, the density and locations of the blocks telegraph the structure and program of the building through its skin. The central stair provides the primary spatial connection between the entry lobby and the second-floor gallery. Its lower three treads are cast-in-place concrete while the upper twenty-one ipe treads are suspended from above, connected visually and physically to a skylight in the roof deck. The staircase is both playful and grand, floating and grounded, expansive and local. In the main gallery, a thirteen-foot-high by fifty-five-foot-long wall is suspended from I-beams that were required to stiffen the bottom chords of the existing steel trusses. Using motorized trollies, the gallery can be quickly reconfigured from a single space that reveals the textured southern wall to a more conventional white wall gallery. Alternatively, the wall can be used to split the gallery into two, or to form a constricted tunnel-like space adjacent to one of the exterior walls. The roof deck is constructed as a large, integrated piece of millwork, with benches that morph into a vertical enclosure, defining a space for gathering. 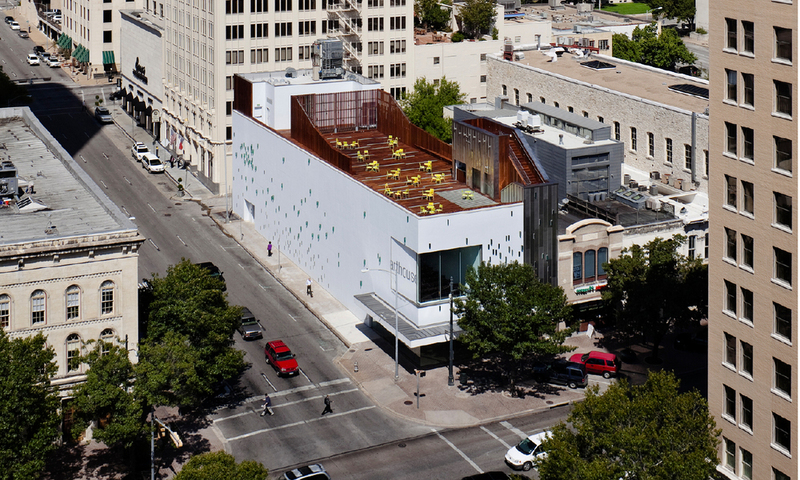 The deck can host a range of events, from outdoor film screening and music performances to informal dinners and formal weddings, all outside yet embedded within the heart of downtown Austin.